Steel pipe fittings are made of steel, it is a collectively referred of variety of steel pipelines to connect work pieces. It can divide into different types according to shape, purpose, and connection modes. It has easy installation, high performance, durability and other characteristics, and it is widely used in a variety of pipeline construction and installation. Steel pipe fittings contain steel elbows, tees, crosses, reducers, black steel pipe caps, steel head, etc. Steel pipe fittings is that the insert the steel pipe into the socket portion of pipe fittings, then along the edge of the circle to do welding pipe fittings. It is the most reliable connection mode. The inner diameter of the pipeline socket = pipe out diameter. By edges of welded pipe section can be further divided into the slope extended side, extended side and no side order these three kinds of pipe fittings. Socket weld specifications generally are DN15-DN100. 1. The docking welded. 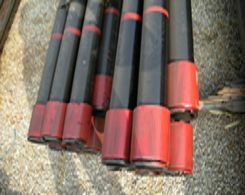 The docking welded pipe fittings are the fittings that make a circle arc welding along the seam in the interfaces of steel pipeline and pipe fittings. Generally need to add welding. The inner diameter of the pipeline socket = pipe out diameter. The docking welded is generally used for larger sizes of steel welded pipe systems. 2. Compression type fittings. They have a reliable and secure connection, convenient and quick construction, suitable for embedded installation, maintenance updates, and relatively favorable economic and other characteristics. The work principle of compression type fittings is that insert the thin wall steel pipe into compression type fittings' socket, using a dedicated compression tool to stuck the steel pipe in the fittings, the cross-sectional shape of the compression part is hexagonal, and there is an O-ring between the steel pipe and the pipe fittings, so it has the characteristics of ending leakage, anti-pull, anti-vibration and high pressure resistance. So it is a kind of more advanced pipe fittings in drinking water systems, water systems, heating systems, steam systems, industrial pipe systems and industrial pipe systems. It is suitable for water, oil, gas and other pipeline connection. 3. Its nominal pressure is less than 1.Mpa. Its operating temperature is from -20℃ to 110℃. Its suitable mediums are oil, water, gas and other non-corrosive or corrosive media. Its pipes are the Φ15.88～Φ108 black steel pipe. 4. Quick bond fittings. Mainly are the mating self locking retainer type fittings. Quick flash access connection is a kind of "self-locking retainer mating connector" technology, just insert the black steel pipe fittings into the pipelines, then we can achieve rapid installation flash effect, and in the demolition, just use the matching lightweight special tools and afterburner grip the quick fittings then we can remove the black steel pipelines. Quick bond fittings are not only more convenient and fast to install and remove, but also have reusable, does not leak, shock, thermal expansion, buffer heat distend and cold shrink, and some other excellent performance, it is a new explosion and breakthrough in the black steel pipelines' connection. The welded steel pipe and API steel pipe are also available.